Mom, the Intern: What is this scary thing? What is this scary thing? 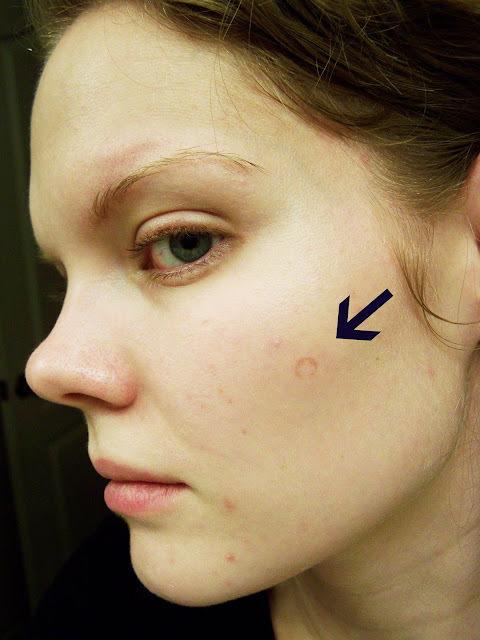 Yesterday, I woke up with this thing on my face -- a perfect circle with a plus sign inside of it. I thought it was an imprint of some kind and ignored it. Then, when I went to take off my make-up before bed, there it was in all its glory. Still hanging out on my left cheek. It does not itch. It does not hurt or sting. It is completely flat and smooth. It is not dry or scaly. I do not remember hitting my face or injuring it. I know you're thinking ringworm. But I Googled ringworm and if that's what this was, it'd be super itchy and scaly. Right? Do you have screws on your bed frame in that size and shape? It seriously looks like you slept on a screw and were resting on it so long it left a more semi-permanent mark. oh my gosh! I have no idea what that is?!??! I hope it goes away soon though! Yes or your ring? Was your wedding ring on your face? I thought wedding ring too, but if it stayed all day, you couldn't have been sleeping on something. If not an imprint from something, it looks like a small circle of ringworm. maybe it's a positive pg test. haha, i'm hilarious. sorry about the mystery. It doesn't have to itch to be ring worm. I've had it plenty of times. I would put an antifungal on it. Nystatin left from thrush or a yeast rash or an antifungal from the store. If it makes it go away that is what it was. At it's fullest is when it is itchy, dry, etc. My vote is still ringworm. Hm, it looks like there's a consensus. Definitely going to wash all my makeup brushes STAT! I think you were kidnapped by aliens and they marked you. It is Halloween after all! Oh no, Jenna! I hope it goes away soon! weeeeeeeeird!!! i hope it goes away! sometimes i wake up with random bruises, but this is definitely weirder. crazy!! Did it go away?!? !